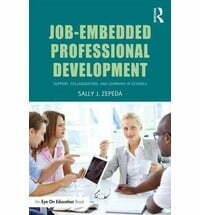 Kudos to friend and colleague Sally J. Zepeda, Professor in the Department of Lifelong Education, Administration, and Policy at the University of Georgia, on the release of her latest book, Job-Enabled Professional Development: Support, Collaboration, and Learning in Schools. And kudos to me for her including my F.O.C.U.S./F.R.A.M.E. Coaching Model in Chapter 5 – Best Practices in Peer Coaching.